East Mid Lamberkin (sometimes spelt Lamberkine) was discovered from the air (as a crop mark) in the 1950’s by the late Prof J.K. St.Joseph. Nothing is visible on the surface, but the site takes the form of a rectangular enclosure, 0.41 ha (1.02 acres) in area over the ditches (fig 1), with sides of c. 68m (n-s) by c. 62m (e-w). It lies at NO 074 225, c. 4km west of the centre of Perth and sits on the 100m contour with excellent views, especially to its north and east. When first found the enclosure had already been damaged by a modern road, the A9, which bisected its southern half, running on a heading of WSW to ENE. Since that time, however, massive additional damage has been done by the conversion of the Stirling to Perth section of this road into the A9(T), a duel carriageway, which here runs in a broad cutting that has irredeemably destroyed the entire southern part of the site, apparently without prior archaeological investigation. Fortunately, a number of superb air photographs survive in the Cambridge Air Photography collection (notably negs CKO57 and AAG40) which show the site before this mutilation took place and so it remains possible to reconstruct plans of virtually the entire ditch circuit. The site was initially identified as a possible small Roman temporary camp, but St.Joseph himself then appeared to lose interest in the feature and never mentioned it in print again. There is, however, a reference in the site’s data sheet in the National Monuments Record (Scotland) to a letter from St.Joseph to the Ordnance Survey of 7th December 1976 in which he said that further work had shown that the site was not Roman. What this work actually was is not recorded, however, and the writers have been unable to trace either the letter itself or any reference to field work on the site in either St.Joseph’s own surviving papers or those of the Ordnance Survey Archaeological Section, held by the RCAHMS. This is a great pity, for any additional insight from the site’s discoverer would have been valuable. Certainly the enclosure’s overall morphology is perfectly compatible with a Roman military site. It has rounded corners and a general playing card shape. Three entrance breaks are visible, one each in the north, south and western ditches, and a fourth, in the eastern ditch may already have been destroyed by the A9 when the site was first seen. Moreover, although all three gates are different in design, each is of a recognisably Roman type. The west gate is a very narrow postern style gap in the ditch, whilst the south gate was a much broader gap of a type more common in temporary camps, and (although it was not strong enough to be marked on fig 1) one of St.Joseph’s air photographs (CUCAP neg AAG40) shows what might be the faint trace of this type’s usual covering titulum. Finally, the north gate shows an outward curving clavicula on its eastern side, of a type best known in Scotland from the famous “Stracathro” series of camps. This is not itself a Stracathro style gate, however, since it lacks the usual straight out turn on its western side. 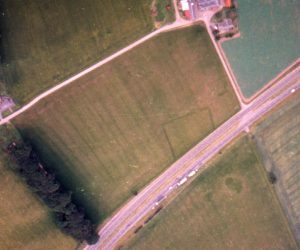 Instead, a single air photograph (now in Perth Museum) taken by local pilot, Mr W. Fuller (Fig 2), shows signs of what may be an answering inward curving clavicula on the gate’s western side (dotted on fig 1), which would produce a more symmetrical gate type previously known from sites such as Cawthorn B and C in Yorkshire. Given this positive morphological evidence, but remembering the doubts eventually expressed by St.Joseph, the Roman Gask Project undertook a resistivity survey and trial ditch section on the site in September 1999. The geophysical results proved to be relatively unhelpful, with the ditch showing only patchily, probably because the survey was undertaken after a period of heavy rain. Nevertheless, they did provide tenuous additional confirmation of the inward curving clavicula at the north gate, visible on Fuller’s air photograph. The section, however, gave more clear cut results (fig 3). It revealed a ditch 3.64m wide and 1.12m deep, when measured from the subsoil top (1.41m deep from the modern ground surface). This proved to have a near perfect V shaped profile of standard Roman military type (despite being cut into an extremely hard clay and rock subsoil), albeit it lacked an “ankle breaker”, bottom sump. Despite this further, and apparently persuasive morphological evidence for a Roman date, however, the history of this ditch remains somewhat ambiguous. 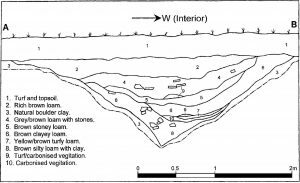 Once dug, it had silted naturally for some time, with a mixture of loamy silt washed in from the surface, and erosion products from the boulder clay, to form a layer (Fig 3, L’8) up to 0.38m thick. Immediately above this, was a thin layer of carbonised vegetable matter (L’10), only 56mm thick and extending only over the western half of the ditch. Two samples were taken from this deposit, one of which was sent to Dr S.Ramsay (University of Glasgow) for environmental analysis (report below), whilst the other was C14 dated and, somewhat unexpectedly, provided a two Sigma calibrated date of AD 585 to 700. This would put the formation of the layer well beyond the date of any likely Roman military occupation and into the Pictish period. The remaining fill layers with the possible exception of layer 2, then seem to have entered the ditch from the interior and L’s 4, 5, 6 and especially the turfy layers, 7 and 9, seem compatible with former rampart material being dumped into the ditch (either deliberately or through plough action), although L’s 7 and 9 could also represent colonisation of an open ditch by plant life. The carbon date is, however, only a terminus ante quem. The layer itself is clearly not primary, being some way above the original ditch bottom, which means that the ditch as a feature must be rather older. Even so, other things being equal, such a relatively narrow band of primary silt need not have taken that long to form and so the ditch construction date might still have fallen within the C14 date range, in which case the ditch (and thus the entire enclosure) may well be Pictish. If so, however, its morphology would be without precedent and, in fact, all things may not be equal, for there are difficulties in explaining the mechanisms by which the layers observed in the ditch section could have formed if only a single continuous process of deposition is envisaged. In particular, the primary silt layer is unusually asymmetrical. On the eastern (external) face it forms a thick layer which reaches much of the way up to the lip, but on the western (interior) side only a thin deposit was found, and even this stretches considerably less far up the ditch face. The carbonised vegetation layer (10) is then left in physical contact with the ditch side at a depth where on the opposite face it would be separated from it by 0.36m of silt. Indeed layer 10 and, above it, a thin turfy layer (L’7) appear to have formed in a somewhat suspicious looking hollow in the top of the primary silt and it seems more than likely that the entire bowl shaped cavity now filled by layers 4, 5, 6, 7, 9 and 10 is a re-cut. If so than the C14 date for layer 10 may have little if any relevance for the date of the original ditch and instead of a Pictish site resembling, or even possibly imitating a Roman military feature, we may have the perhaps more plausible scenario of pictish reuse of an existing small Roman camp. It should be stressed that this cannot yet be regarded as proven and it would certainly be useful to undertake further work here, especially around the north gate and in the interior, but for the moment the site does still appear to be best explained as, at least in origin, a Roman camp, in which case it is currently the smallest known north of the Antonine Wall. 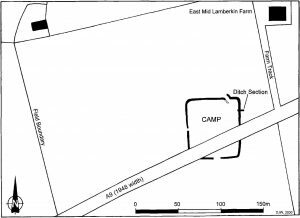 Furthermore, if this interpretation is correct, this site is also the most tempting to explain as a Roman practice camp, rather than as a work camp or as an overnight bivouac for some small detachment on the move. For the ditch seems unusually substantial for the tiny area enclosed, especially given the extremely hard nature of the subsoil. Moreover, so far as the writers have been able to ascertain, the presence here of three different gate types in one Roman camp is unique, although sites, such as Cawthorn camp A (Welfare and Swan 1995, 12, No 72) are known with two gate types, and although it cannot be proven (and may never be) it is tempting to wonder if a group of Roman recruits might have received training here in constructing a range of different gate types. This sample (Organic sample 2) comes from the ditch fill of a Roman temporary camp at East Mid Lamberkin but derives from a layer (L’10) which lies significantly above those thought to be of Roman date. The sample itself has been radio carbon dated to Cal AD 585-700. The organic sample was sieved through a 300µm mesh and the residue left to dry before examination. The residue were sorted under low magnification (x 8 – x 40) and carbonised plant remains were removed.